Welcome to Duebbekold in Wendland, the heart of nature, with its idyllic green meadows in a valley surrounded by woods and the nearby river Elbe. 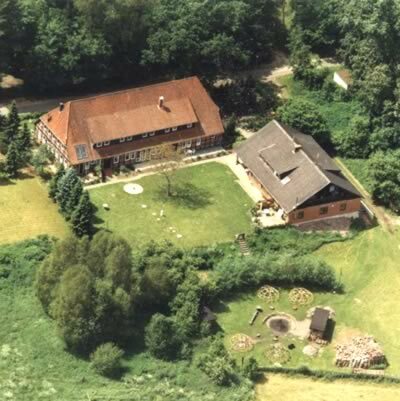 Our little village consists of 4 houses amidst the nature park and state forest of Goehrde, and is located south of Lueneburg and only 60 minutes by car from Hamburg north of us. The river Elbe with its white sandy beaches, invites you to go swimming or go on canoe trips. The woods are beautiful and interesting, and perfect for bike riding, nordic walking, jogging, horse back riding and easy strolls out in nature. The quietness is enchanting. The Lueneburger Heide is an area for touristy interests for the whole family. Even day trips to the North Sea and the Baltic Sea are worth their while. Our attractive house with indoor pool and sauna offers recreation and wellness with our newly renovated and furnished rooms. We have friendly and comfortable rooms, cozy apartments with wood stove and terraces and many spots in the gardens for hide aways and relaxation. The nature all around us is a place to recharge your batteries and your funfilled vacation will be appreciated by every family member. The seminar part offers two well equipped rooms with their individual dining rooms and kitchens as well as beautiful, sun filled newly furnished double rooms with baths. The lawn with a walnut tree and the meadows of our garden are just right for sports activities and recreational body exercises. top All items subject to change.